Calendar: «Women’s Equality Day», «International Day of Women and Girls in Science», «International Women’s Day». 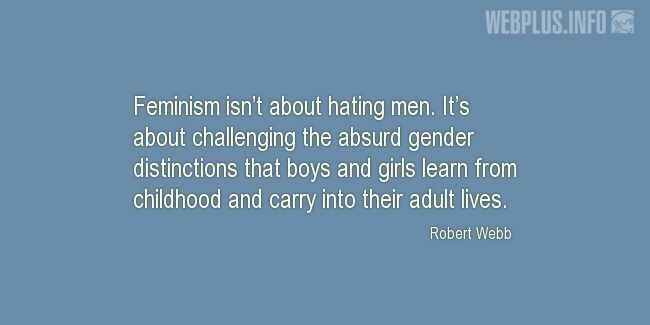 «Feminism isn’t about hating men» illustrated quotation. Women’s Equality and feminism, free quote pictures for Facebook, Twitter, LinkedIn, Reddit, Pinterest and other social networks. Feminism isn’t about hating men. It’s about challenging the absurd gender distinctions that boys and girls learn from childhood and carry into their adult lives.